The Springs of Vernon Hills Alzheimer's Special Care Center located in Vernon Hills, IL, offers both memory care and respite care for seniors. With an outstanding staff and beautiful 66-bed community, The Springs of Vernon Hills is thoroughly equipped to meet your loved one's physical, social, mental and emotional needs. Meaningful Moments® approach, our team provides a warm and meaningful assisted living environment that includes family and friends. We welcome and encourage you to join us in the many activities we offer at The Springs of Vernon Hills Alzheimer's Special Care Center. Memory Care: Our exclusive Meaningful Moments® training enables our caring and highly-trained staff to learn about our memory care residents' lives before the effects of dementia started to develop. These life-long preferences are then built into each resident's daily life to provide a sense of the familiar and create meaning in each day. Respite Care: For those seniors in need of rehabilitation after an injury or caregivers who need a break from the demands of caring for a loved one, the respite services of The Springs of Vernon Hills Alzheimer's Special Care Center are beyond compare. Visit The Springs of Vernon Hills Alzheimer's Special Care Center today or call us and find out first-hand how our senior services can not only help but enhance the life of your loved one. Adult Day Services: Our Day Program is just a phone call away. If you’re a caretaker for a senior living with memory loss, you may need some time to yourself. While you’re running errands, attending a grandchild’s school event, or relaxing, The Springs of Vernon Hills Day Program is the perfect solution for your loved one. We create meaningful moments for each person under our care while ensuring their safety and well-being. Day participants will enjoy a full day of activities that help stimulate and nourish both the body and mind – everything from art therapy and dancing to games and storytelling – and everything in between. Our Day Program helps people living with dementia maintain a fulfilling life of purpose and enjoyment while receiving all the same services our full-time family members enjoy. Your loved one can come for the day, and they will enjoy the experience of a lifetime. 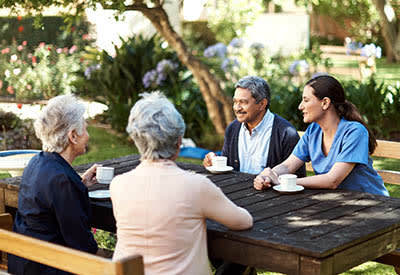 The staff at The Springs of Vernon Hills Alzheimer's Special Care Center incorporates each individual resident’s life story into their personalized daily care plan. Utilizing our distinctive Meaningful Moments® approach, our team provides a warm and meaningful assisted living environment that includes family and friends. We welcome and encourage you to join us in the many activities we offer at The Springs of Vernon Hills Alzheimer's Special Care Center.